It’s officially summer and we would love to be a part of your summer break adventures! Photograph Drumstick with you during your summer vacation and upload your photo below for a chance to win an Eat and Sleep package at Zehnder’s Splash Village for a family of four which includes an overnight stay, waterpark passes, Family Style Chicken Dinner at Zehnder’s Restaurant and breakfast at Elf Hollow Cafe. • Purchase a plush Drumstick at the Zehnder’s Splash Village Gift Shop, Zehnder’s Marketplace or online at www.zehndersstore.com. 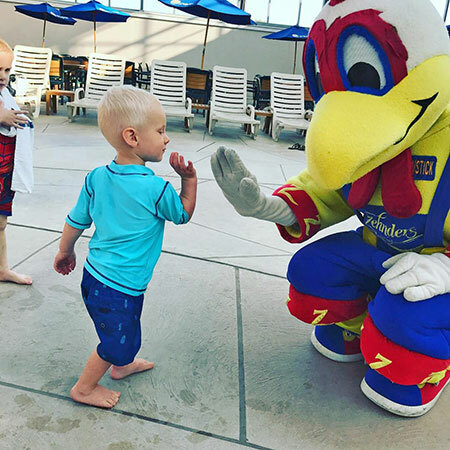 • Photograph Drumstick enjoying summer break with you, post your pics to social media and mention @ZSplashVillage with hashtag #DrumstickSummer*. OR upload your photo below. Be creative! Contest starts July 1st, 2018. All photos must be posted by August 31, 2018 to be eligible. Fans vote for their favorite photo starting September 3, 2018. Click here to view the contest terms and conditions. *Note: all social media profiles must be public in order to be considered.